Moments before her small chartered plane crashes into the treacherous White Mountains of New Hampshire, Kylie O’Rourke notices a raven standing placidly on the wing looking at her through disntincly human eyes. Regaining consciousness in a Boston hospital, Kylie finds that the peculiar raven was a herald of things to come and that her world has been irrevocably altered. She is haunted by improbable memories of the crash: though trapped within the wreckage, she recalls wandering the ice mountainside and speaking with one of the other passengers only to find that he’d died on impact. As the bizarre aftermath grows clearer it appears more omnious, and Kylie must fight for her life despite increasing evidence that she is living on borrowed time. One of the reasons why I love books so much may be the escapism; getting lost in the pages of a good novel are absolutely wonderful. I feel as if I could be a fly (or a cute bug. No offense to flies of course.) on the wall. It takes me to worlds otherwise unimagined. The feeling is incredibly potent, fueling me to turn the pages like a madwoman- especially once I got passed the cover. Which isn’t to say that the cover was bad. It just wasn’t great. The red lettering of the title caught my attention. The only thing is the faded white birds (I’ll admit only a few of them look like birds…) seemed to remind me of the ghosts in Bowzer’s castle in SuperMario? Once my chortles eventually ceased and I was wrapped up in the first couple of pages, it didn’t take very long for that potent fuel thing I was talking about to kick in. Quietus by Vivian Schilling gave me chills and left me with an eerie feeling of paranoia once I’d skittered across the very last sentence. One thing I admired about this book is how quickly the plot of set into motion. You know those sorts of books where you’ve read nearly halfway through and still– nothing has happened (nothing worth gasping or swooning over anyway…) and you’re just about ready to chuck it across the room? Yeah. Nobody likes those books. Nobody being me and likes being…you know; actual loathing. Those are the sort of books that make me want to skip pages just to find out what’s happening and I’m told that is not a good thing. When this happens- I skip large amounts of pages, sometimes I’ll just skip all the way to the end and read the book backwards to the part where I became frustrated at OR I’ll stop reading all together. It’s a very sad thing. Fortunately, this didn’t happen! The summary basically gives away the first few chapters. Just before their plane crashes, main character Kylie notices something strange. At such a high altitude, a bird had somehow managed to land and sit on the wing of the plane. (I feel a little bit guilty for listening to Up With the Birds by Coldplay as I type). The characters reach out and grab hold of you, forcing you to feel what it is that they feel at any given moment. I was instantly absorbed with fear, confusion and still an odd sense of fascination. As the story progresses, it wipes the thought that it will be anything but ordinary from your mind. I think I must’ve had goosebumps the whole time I was reading. Quietus introduces a different spin on the existance of death, and how once it comes knocking at your door, taking your welcome mat much too seriously– there’s not much that you can do. But what if you don’t die? We discover just what it means to disturb the balance between life and death. I’m trying not to spoil anything, but I don’t think it’s working very well. This novel creeped me out, but in a good way. How could something creepy be perceived in a positive light? Read this book and you’ll find out. I’ve been passing it around like a newborn baby to friends and family every since. I loved it. 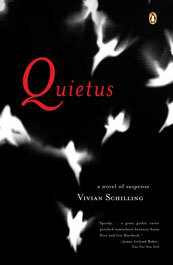 Quietus by Vivian Schilling (whose name I’ve been writing wrong for ages by the way. I’ll give the excuse that I haven’t seen or known the whereabouts of my book in a while.) earns 5 out of 5 stars from me. Be sure to check it out! This entry was posted in 2012, Reviews and tagged Book Reviews, Books, Fantasy, Horror, literature, Mystery, Paranormal, quietus, Sasha, thriller, vivian schilling by dreamingwithink. Bookmark the permalink.